Description: When Kylie Galen left Shadow Falls, she thought it was the hardest decision of her life. Heartbroken and separated from everyone she loves, she has to embrace her abilities and what it means to be a chameleon. But as Kylie's journey comes to a close, she must return to the camp that started it all...and she must finally chose between the two boys who love her. The werewolf who broke her heart when he chose his pack over her, and the half-fae who ran from their intense attraction before they ever really had a chance. For Kylie, everything will finally be revealed and nothing will ever be the same. Chosen at Nightfall is the last book in the Shadow Falls series by C.C Hunter. It’s a wonderfully satisfying ending to a great series. This series is just plain entertaining and very addictive even though it has a few issues. It’s almost like a guilty pleasure, full of drama, ghosts and epic misunderstandings. Kylie and the gang get into such complicated situations that are always laugh out loud fun. They are perfect books to lose yourself in and distract yourself from the drama in real life. In Chosen at Nightfall we get to see the conclusion of Kylie’s journey and witness what’s next for Derek, Lucas, Miranda, Perry, Della, Holiday and Burnett. C.C Hunter wraps things up nicely and all the questions that have been present since the first book Born at Midnight are finally answered. From the beginning this series was always about Kylie and her quest to find out who she was and where she came from. I’m happy to report that Kylie finally finds all the answers she’s always wanted and more as she learns more about protectors, chameleons and death angels. Chosen at Nightfall picks up with Kylie living with her grandfather in order to learn more about her supernatural abilities as a chameleon. As a threat looms Kylie returns to Shadow Falls Camp with a bloody ghost in tow and a whole new set of problems. She has to contend with a new quest, old enemies, ex- boyfriends and a sword that magically turns up everywhere she goes. Another major part of this series has been Kylie’s romantic interludes and the love triangle between her, Lucas and Derek. This triangle has managed to last five books and has been the root cause of several problems. Kylie finally picks between Lucas and Derek and all the romantic entanglements are sorted out and explained. Kylie is a strong vibrant character. She some how manages to just keep going even though she has a lot on her plate with all of her supernatural abilities, ghost troubles and romantic woes. Kylie is very protective of the people she loves and she fights very hard to keep them all safe. You can see why she was named a protector. She is always trying to be sensible and it’s amusing seeing everyone come to her for advice. The best part of these books has been always been the relationships. Kylie has amazing female relationships with her friends Miranda and Della. It is always a treat to see them all sitting at the kitchen table discussing their lives. Kylie has a whole cast of secondary characters who are there to help and support her including Perry, Chris, Helen and Jonathan. Their antics are sure to make you smile. Derek has always been a supportive friend to Kylie and their relationships has always been changing. I am glad that they finally figure out what they mean to each other. Lucas is a lot more present in this book and you get to see how much is cares about Kylie. Last but not least, Holiday and Burnett are always around to protect the students and we get to see them get their happy ending as well. 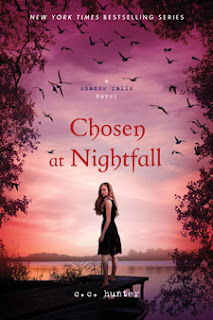 Chosen at Nightfall is a satisfying conclusion to a wonderful series. Questions are answered, storylines are wrapped up and Kylie gets an ending she deserves.